If a movie ever deserved to be abandoned in the woods, it’s ‘Chernobyl Diaires’. A wasted opportunity if there ever was one, Oren Peli’s (Paranormal Activity) anemic Chernobyl Diaries could have been an inspired bit of B-movie gold if it had been a little less half-assed. The story features the usual stock horror movie victims — er, characters — six young vacationers hanging out in the Ukraine who decide to engage in an afternoon of “extreme tourism” (two words that do not belong together). 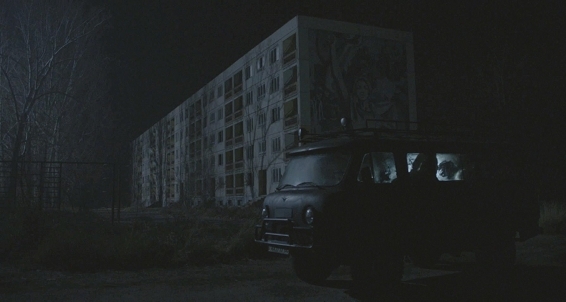 They hire an ex-special forces soldier and self-employed tour guide named Uri (Dimitri Diatchenko) to take them on a guided tour of Pripyat, the former home to the workers of the Chernobyl nuclear reactor, now a deserted town since the meltdown that irradiated the area more than 25 years ago. Of course, the get stranded right at sunset, and of course there is something still living in Pripyat that is eager to prey upon a pack of beautiful people. That these clowns thought the trip was a good idea to begin with suggests they deserve what they get. The audience, however, deserves better than what they are given. It starts off promisingly enough, wringing plenty of dreadful atmosphere from its unique, real-life ghost-town setting; unfortunately, it fizzles quickly and devolves into an hour’s worth of Blair Witch tedium as the group runs around screaming in the dark in between bouts of increasingly poor decision-making and being unceremoniously dragged away into the darkness one at a time. The premise and eerie location a pure gold, but Peli passes up every opportunity to craft a decent horror flick from his raw material. The most intriguing character gets bumped off first, and the weirdness peaks with an unexpected cameo by a brown bear during the first act. The scares are minimal and routine, the action is bland and bloodless, the monsters are barely glimpsed and never defined, and the suspense evaporates faster tan you can say “dasvidaniya”. South Padre on Spring Break is more terrifying with this.